An on-board real-time clock (RTC) based around the STMicroelectronics M41T81S ensures that accurate time can be kept in the event of a power failure or when the system is legitimately powered down. The RTC provides counters for tenths/hundredths of seconds, seconds, minutes, hours, day, date, month year and century. An ultra low battery supply current of 0.6uA ensures extremely long backup battery lifetime, which is further enhanced by the devices ability to automatically switch between battery supply and primary 3.3V power supply when the latter is available. In the event of an unexpected power failure, the RTC can provide a timestamp indicating what time the power failure occurred. To use the RTC on the Tellurium make sure to set the protocol to 4 in the registry for the RTCSync. 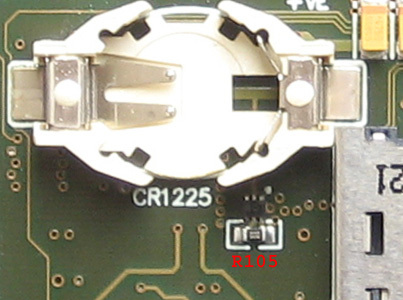 Pin 40 on the Colibri module SODIMM connector can be used to power the VCC_BATT supply to the PXAxxx processor to provide its required power supply when in deep sleep mode, allowing the internal RTC of the PXAxxx to be used. This supply is powered by the 3.3V main supply when it is present, and by default on the Tellurium board, by the CR1225 battery when the 3.3V supply is not present. To disable the CR1225 battery supply such that only the external RTC is powered when the 3.3V supply is not present (and hence VCC_BATT is not supplied by the CR1225 battery under any condition), the zero ohm link resistor shown in R105 in the picture below should be removed from the Tellurium board. This will increase life of the CR1225 battery, especially in situations where the device is likely to be unpowered for long periods.